The Mizoram PCC media department on Wednesday accused the Mizo National Front of being in agreement to work together for the upcoming Mizoram polls bound for November 28. The Mizoram PCC media department addressing media at Aizawl on Wednesday Photo: S Hmar. 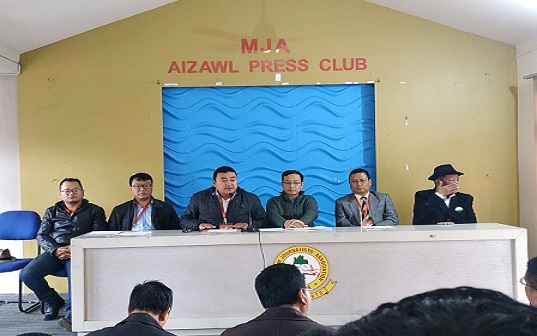 The Mizoram PCC media department on Wednesday accused the Mizo National Front (MNF) of being in agreement to work together for the upcoming Mizoram polls bound for November 28. “It is evident that the MNF and the BJP are scratching each other’s back. Recently the largest NGO of the state – the Central Young Mizo Association (CYMA) even went to the extent of scolding the MNF over the alleged BJP’s infamous initiatives to lure ethnically minorities in the state,” Lallianchhunga, chairman of media department, Mizoram PCC said. Recently the CYMA warned the MNF not to indulge in vote lobbying that could harm the integrity of Mizoram. Leaders of the CYMA said that they have received reliable information that the BJP has asked the Brus and the Chakmas to vote for the MNF if not the BJP. Dr Lalmalsawma Nghaka, president of the Mizoram Pradesh Youth Congress said the evidence lie in the very fact that the MNF are a part of the BJP led Northeast Democratic Alliance. “There are several media reports that proved the MNF and the BJP are closely knitted. Only recently Tripura BJP general secretary Pratima Bhowmik said the BJP and the MNF would form the next Mizortam government together,” Dr Lalmalsawma alleged. Dr Lalmalsawma alleged that Pratima Bhowmik made this statement in the presence of Ram Madhav, Tripura chief minister Biplab Kumar Deb, minister Santana Chakma and two BJP MLAs Pramod Reang and Shambhu Lal Chakma on October 23, 2018 at a BJP rally in Kamalanagar, Lawngtlai district of Mizoram. “The national leadership of the BJP knew that the saffron party is seen as a threat to the Christian communities of Mizoram and hence playing the game apprehensively. The reason for the late shifting of the state BJP president JV Hluna from his proposed Aizawl East I constituency to Tawi AC was the diktat of the central BJP leadership. The BJP leadership couldn’t allow their state president to fight the MNF president at the constituency,” Dr Lalmalsawma Nghaka said. There has been a huge speculation over the alleged pre-poll tying up of the MNF and the BJP but then both the parties vehemently denied the allegation. However the political debate goes on in the state since MNF shared a common political platform – the NEDA, a conglomerate of non-Congress parties in the region, with the MNF president Zoramthanga among the founding members.